There are many different ways to intensify the color and feel of a room. One easy way to add drama to windows is by the addition of well-crafted lined valances. Hanging drapes are usually lined with valances for windows and are placed on the upper portion. 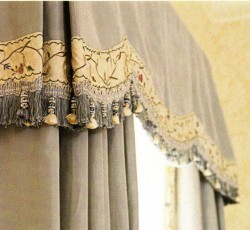 Usual fabrics for lined valances included cotton, hosiery and the ever luxurious Georgette or rich silk. The right option for you will be one that works well within your design and also adds in a touch of your personality within its style. It is a much easier way to experiment with shades of color and styles when choosing valances compared to larger pieces of home decor. They are relatively small in proportion to the room and by choosing from a trendy yet subtle collection, you can begin to add in colors that you may normally shy away from. The best way to start shopping for your lined window valance is to set a budget and shop accordingly. A modest budget may give such options as cotton or jute, while a larger budget may afford silks or satins. By setting and adhering to a budget early on, you can assure yourself of not falling in love with something you can not afford, as well as staying within your spending limits. You can also create a different feel to your room with the colors you choose for your lined valance. A darker jewel toned valance with a softer colored liner will add depth and sophistication to your space while lighter colors can add vibrancy and a brighter feel. There are typically three types of valances in which to choose, namely: swag, balloon and ascot. If you prefer a soft and airy feel, a flowing swag style may be your best option. If your tastes run more contemporary and modern, a balloon valance could meet your design needs. And, if you like the traditional, opt for an ascot lined window valance. You can also add details to your window valances with silk flowers, ribbons, bows, or a string of pearls. Small details will not only adorn your windows but can also add a touch of authenticity and uniqueness to the room. Bay windows are also a wonderful place to add a valance as it will lighten up the room, and will reflect the sunlight creating a warm and cozy atmosphere. A typical set of lined valances may cost in the range of fifty to eighty dollars, which would also include the cost of the liner, but if you like to stay away from the cookie-cutter look and add a touch of the unique, you may be able to get them customized for just a few dollars more.